Samsung was fighting the noble cause of resisting the notch all throughout 2018, but it seems that for 2019 the company decided that if it makes one small enough, consumers will forgive it. 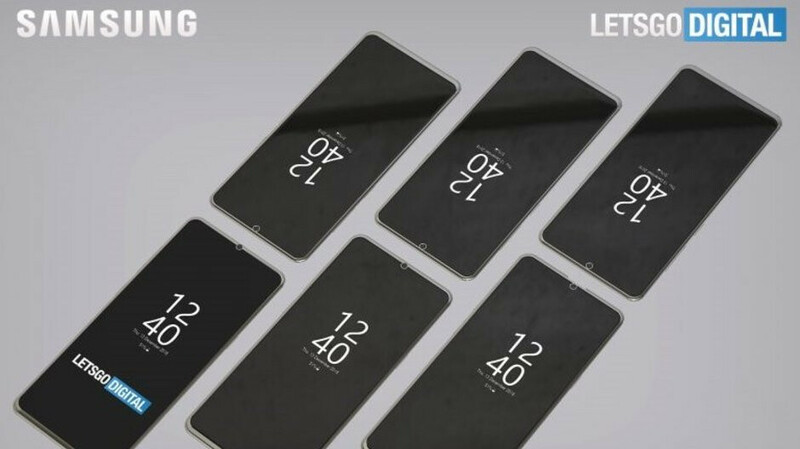 Recently, we saw Samsung showing off its ideas for different display cutouts, but now it’s going further to make sure that no one will use that “unique” design by patenting a few notches at the Korean Intellectual Property Office, LetsGoDigital found out. 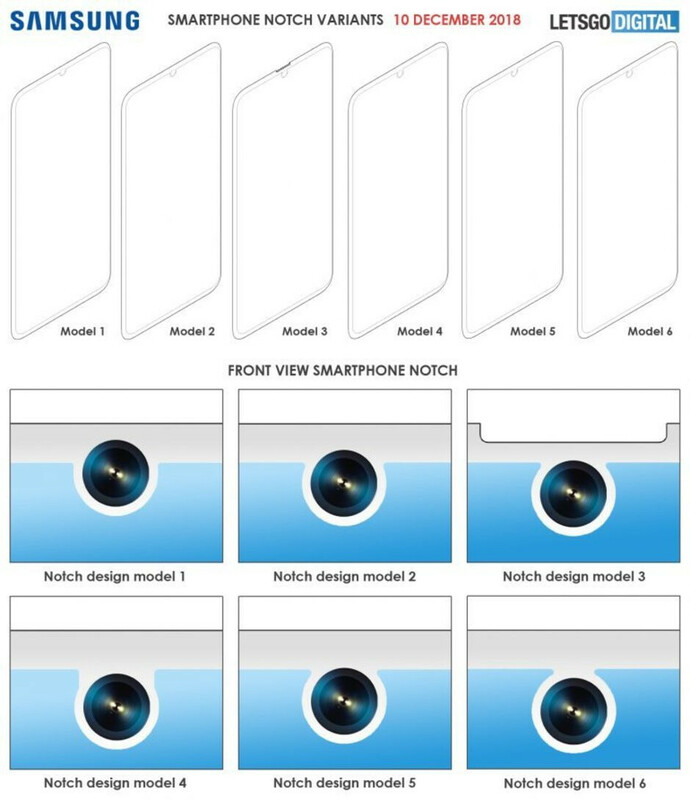 The six notches in question are of the “teardrop” variety and when put together seem to represent the process in which an essential-phone-styled notch evolves to become a display hole, with the very last step missing. Each notch model shows a front-facing camera protruding more and more into the display and shying away from the bezel of the display. A similar looking notch was recently patented with the USPTO, although without all of its siblings. It’s very unlikely that we’ll see devices with all of these notches, however, Samsung is probably just making sure it has all the bases covered before seeing exactly where the camera will end up on the final design(s) of its future phone(s). The camera is depicted in the patents appears to be in the middle of the display, as is usual, which differs from the renders we’ve seen with a selfie camera hole in the corner. This design might be reserved for Samsung's cheaper smartphones. The tiny notch and display hole are the two designs we can expect to see over and over again on smartphones from different manufacturers in 2019 before the front-facing camera can finally be hidden under the display altogether, hopefully as early as 2020. Notch looks unobtrusive. I think it would all but disappear in normal use. The 1st looks the best out of the bunch. Agreed. The further off the screen it is, the better, so the choice is obvious. Remember when Samsunb mocked iphone X with their ingenious ads about NoTch. What happen???!!! I thought Samsung fans loved their infinity top and bottom chins. Not just Samsung, everyone did... iPhone notch is huge. The fact Samsung is making a much smaller notch is a good thing, so plz don’t compare Samsung notch to that huge unibrow. Its still a notch! Stupid. Now since its smaller then its good. That’s ingenious. Pot calling the kettle black....not that you'd understand what that means given your history. Eh, looks better than the one on the Pixel 3 XL. what the heck man? it's Samsung, it's a hole not a notch! Again, you guys do know that Samsung sells displays to other companies. So just because they may make them, it doesn't mean they will use them. And that tiny hole? I dunno what's wrong with your eyes, but that is hardly a notch. And making it small isnt looking for forgiveness. Making it small simply means it's less obstructive. Sams uh ng doesn't need to be forgiven because they aren't doing anything wrong. Just something stupid. Just make the bezel the same thickness as the cameras until you can make it all screen. There is simple solution to making an all screen phonr. Just remove the front facing cameras period. All they have to do is put a very small screen that is maybe 1" square where you can point the rear camera at yourself and you can see a small image so you can see how to aim it and snap. A notch, a hole or whatever are all stupid decisions. Just keep the bezel until you can perfect an allcsreen solution. No one is gonna care if they still have bezels...thin or thick. Technically it's a hole that's really close to the top bezel. It's something even better than waterdrop notch. Oh s**t literally just saw the caption wtf PA.